To become a star, a person needs to have a lot of luck, skills, discipline, and the right timing. To remain a star, a person needs to have passion, a strong support system, humility, and heart. There are very few people in this world who has all of these. Lea Salonga is one of them. 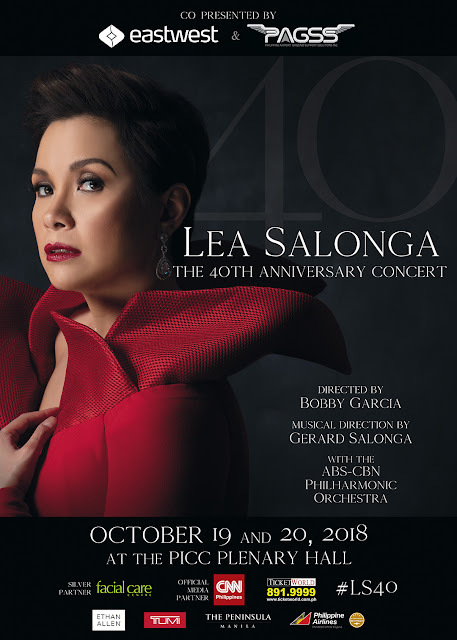 Lea Salonga's tickets have already sold out as of this writing and here are 4 reasons why 40 years later, she can still sell out concert tickets and remain one of the most recognized names in the industry. 1. Lea is a professional. In this industry where a diva is born every minute and stars think they are entitled, Lea remains a professional. She arrives on time, does what is expected of her, and appreciates the people around her. She can actually throw a tantrum and get away with it but she doesn't. She respects the craft too much. 2. Lea has a strong support system. I met Lea's Mom. Ligaya, and I was able to learn how she managed Lea and her career. She was able to combine the protective side of being a Mother as well as the practical but sensible side of being a manager. 3. Lea respects her voice. Other singers would smoke and not take care of their voice but Lea doesn't do that. She takes care of it because as she says, it is her bread and butter. 4. Lea appreciates what she has. Even with her many awards and recognition, Lea has not allowed any of that to go to her head. She ensures her feet are firmly planted on the ground and that she still takes time to stop and smell the roses. Even with the huge fame she has surrounding her, she knows what really matters in life. 40 years of amazing musical history and looking forward to new things to come. ‘Lea Salonga – The 40th Anniversary Concert’ is directed by Bobby Garcia, with musical direction by Gerard Salonga, and featuring the ABS-CBN Philharmonic Orchestra. The show is co-presented by East West Bank and the Philipiine Airport Ground Support Solutions, Inc. (PAGSS). It is in partnership with Facial Care Centre, Ethan Allen, Tumi, Philippine Airlines and The Manila Peninsula, with CNN Philippines as exclusive media partner.